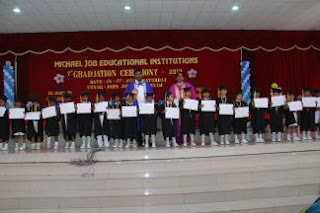 On 6th July we had our convocation for the year 2013. We at MJC celebrate our convocation in a unique way. Convocation is just not for those who complete graduation and post graduation. We celebrate each key milestone in the journey of education of the angels in MJC. Move from KG to Primary, High School to Senior High School (class 10 to 11) completion of Senior High School (class 12), Completion of Graduation, Completion of Post Graduation, Completion of Bachelor in Education and so on. We also use this occasion to honour those among us who have outstanding academic achievements in college or university level. This year we were blessed with a distinguished panel of dignitaries among us for the convocation. What made their presence more special for us was that they did not join us as celebrities gracing the occasion, they were with us as well wishers and supporters who would continue to advice and support the vision of MJC. 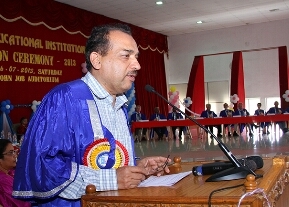 As the chief guest we had Dr Cyriac Thomas, Member National Commission for Minority Educational Institutions. He is a Ph D in Political Science and had a distinguished academic career spanning four decades. Prior to this current assignment, he was the Vice Chancellor of Mahatma Gandhi University. In his address, he commented on the scale and scope MJC has managed in a short time. 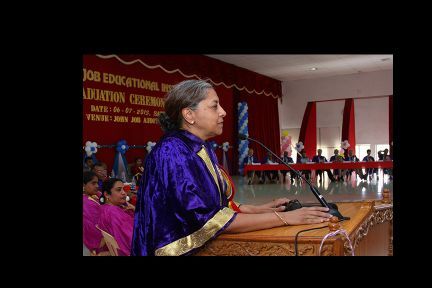 We had Dr Indira Rajaraman a sitting board member of the Reserve Bank of India A Ph D in Economics from Cornell, she had illustrious career at Indian Institute of Management, Bangalore, National Institute of Public Finance and Policy and Indian Statistical Institute. Later she was member of 13th Finance Commission. She gave a special message to the children on how education can change their life. Other dignitories who graced the occassion include Hon George Parakkan, Judge Central Administrative Tribunel, Dr John V George (IPS Retd) former DGP of Hariyana, Mr. Zakir Thomas, Commissionor of Income Tax, Ms Brinda Adige a renowned social activist, Rev Hans Brown from Denmark,Rev Jan Bor from Holland and Mr Bert Dorenbos of Cry of Life.